Kobo Arc review | What Hi-Fi? Like the Kindle Fire HD, the Kobo Arc comes from a company with a background in ebooks and e-readers, to the extent that in the UK it’s affiliated with WH Smith. Also like the Kindle, it has a 7in, 1280 x 800-pixel screen and costs £160. The Kobo is a more compact device, though, and unlike the Kindle has the standard Android 4.0 operating system, albeit with a neat homepage skin that involves you collecting and arranging apps, pictures, books and the like into nicely presented folders called Tapestries. The Kobo might do everything a normal tablet does, but still leans quite heavily towards reading. By telling it the types of books you like when you first set it up it can tailor its recommendations for you, and you get a big discount for your first ebook purchase. An e-ink device is best for serious reading, but we also found the Arc’s LCD to be pretty kind on the eyes. For movie lovers there’s lots to like here. You can rent or buy SD and HD movies from Google Play, there’s native support for AVI files and you can add MKV playback through an app such as MX Player. And video playback is impressive – there’s just a touch of noise to the Google Play download of Looper, but colours are very natural, detail’s decent, and motion’s generally very solid. Overall we certainly prefer the video performance to that of the Kindle Fire HD – it’s just that bit sharper and more neutral. Of course, with Google Play comes access to millions of apps and tonnes of games. While the Kobo Arc is far from a powerhouse, especially next to the Tegra 3-toting tablets you’ll find elsewhere, it’s perfectly capable of playing casual games such as Cut the Rope and Temple Run 2 without hassle, the latter zipping along smoothly, with sharp definition and very good detail. Music is a more qualified success. On the one hand there’s great format support as well as all the usual music apps, but on the other hand the delivery via headphones is woolly and lethargic. Mind you, it does have front-firing speakers that provide very direct, clear audio by tablet standards. 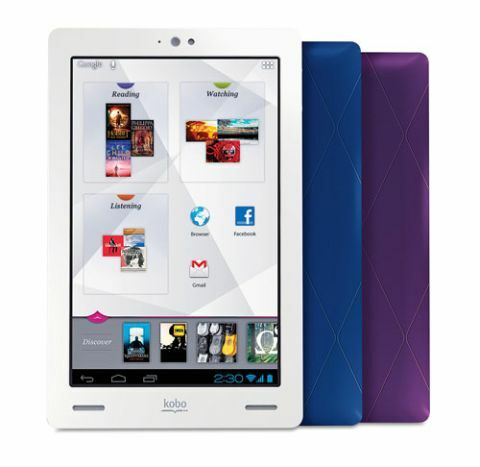 It’s a great shame, as otherwise the Kobo could be the perfect choice for those looking for a cheap Android tablet. If movies and general app use are your priorities it’s well worth a look, but if music matters there are better options available.